In honor of Community Media Day on October 20, Brattleboro Community Television announces its producer awards winners for 2018. 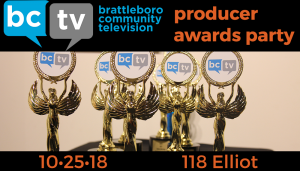 BCTV’s annual producer awards ceremony will be held on October 25th at 6:00 p.m. at 118 Elliot, and the public is invited. The People’s Choice Award winner, which is a popular vote among the year’s top-viewed videos, will also be announced that night. The following organizations and individuals will be recognized. Brattleboro Rotary Club past chair Marty Cohn, who’s also a producer at BCTV, created the show “Rotary Cares,” producing 10 episodes since October 2017. Each monthly episode features two members from Brattleboro Sunrise Rotary or Brattleboro Rotary Club to talk about Rotary International and discuss local projects. Cohn says, “Not only do we reach the viewers in Brattleboro, but we also reach a world wide audience by posting the link on our website and social media pages.” The video director for the series is Rotary Club member Kevin Yager. BCTV’s 50+ local producers were nationally recognized in 2018 and together with staff produced more than 1200 hours of local programming over the past year. Brattleboro Community Television is a community media center serving Brattleboro, Dummerston, Guilford, Jamaica, Newfane, Putney, Townshend and Vernon. BCTV’s mission is to promote civic engagement and transparency, and to empower community members to share their knowledge, views and creativity, without prejudice. To learn more about BCTV, visit brattleborotv.org or call 802-257-0888.